A mental health facility in Staffordshire was engulfed in flames last night (February 11) after a man allegedly set fire to the building. 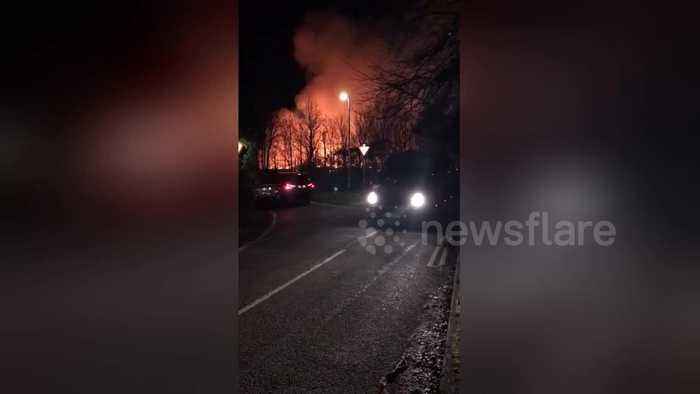 A 43-year-old man has been detained on suspicion of arson after the George Bryan Medical Centre, which is part of the Sir Robert Peel Community Hospital, went up in flames at around 9 pm last night. The building, which is the hospital’s mental health facility, was evacuated and all members of staff and patients were escorted out safely. Staffordshire Fire & Rescue Service confirmed 10 fire engines were at the scene and one spokesman explained: "We're trying to sacrifice part of the building and let that burn to prevent it from spreading to the rest of the hospital.” The filmer said: "At around 9 pm last night we became aware of a number of Fire Engines in the near vicinity. "A large fire had broken out at the nearby George Bryan Medical Centre in Tamworth. "I filmed the incident at around 9.45pm from just outside the location. "The unit is a residential centre for people suffering from a range of Mental illnesses."